This trip to the Amazon was to be my third, the 2nd for Mrs Me, but the shortest. On previous trips, we’d sailed (on a cruise ship of course, I’m not that adventurous) up the Amazon (calling at Macapa) all the way to Manaus visiting Parintins and Santarem en route plus an overnight trip to Ariau Amazon Towers [some love it, some hate: – we love it], a kind of jungle lodge on stilts. This however the itinerary this year would be just Macapa and Santarem, to see the meeting of the waters and do a spot of piranha fishing. We were however due to do a ‘sail by’ of Devils Island as we came out of the Amazon (future Post). 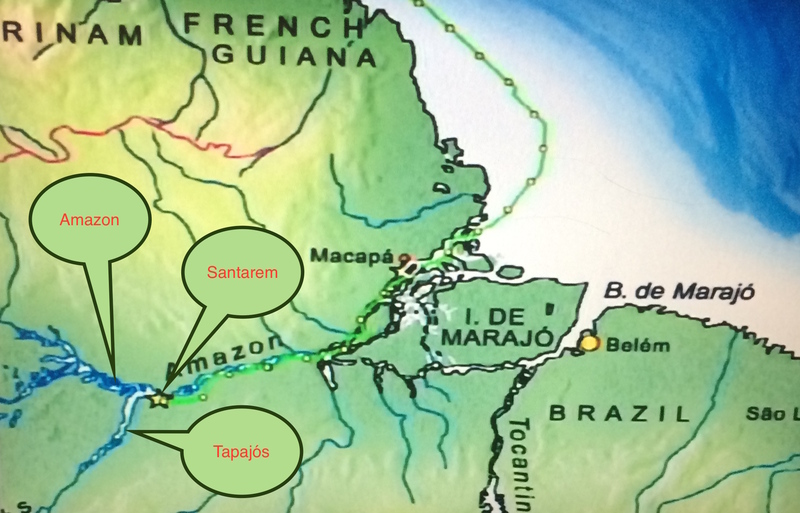 As always, visiting the Amazon was to be the highlight of our trip, this time consisting of two days sailing along the mighty Amazon River and a day spent ashore at in the town of Santarem, located as it is, on the Tapajós River. As we crossed the sandbar into ‘effectively’ the Mouth of the Amazon, we were still 60+ nautical miles away from the nearest lands! Yet even here, the water had turned into the muddy brown colour for which the river is well known. Our first port of call, which was actually a 2-hour stop in the middle of the river, was at Macapa: This was to allow immigration officials and river pilots to join us, for the duration, to help navigate the river – sounds to me like a cool 3-day jolly if you ask me. Once on board, we set off and through the course of the first day, the Amazon unveiled its beauty for all to see: we passed isolated dwellings, little more than huts; sometimes built on stilts to lift them above the flood level, where the inhabitants would wave at us or even try to chase us in their little, woefully underpowered, boats. I have no idea whet would have done if they’d caught up with us (perhaps they were pirate scouts), but they never did, though it was quite amusing to watch them bob about somewhat precariously in the wake of our ship 🙂. Day-2 brought us into Santarem and as we drew towards our mooring yours truly was dispatched by Mrs. Me to report back on our progress and to let her know, supported of course by her morning cup of team, when it was a suitable time for her to arise and view the town. When she did eventually surface, the temperature on our balcony, as indicated by my Garmin, was 97.7f: in anybody’s book, that is hot and for which I received my first thick ear of the day, for not warning her. But, arise she had to, as we were booked to take a boat trip to see the meeting of the waters, view locals wildlife and do a spot of piranha fishing. After this we went to a smaller tributary to view the wildlife, you know the sort, cows, sheep, chickens, water buffalo, iguanas, sloths, vultures, etc., etc. Oh, we also saw some more local dwellings on stilts. After a while we stopped and started fishing for Piranha. Mrs. Me took her place on the boat between my and another gentleman and inevitably, after the other gentleman and I had pre-baited [her] swim, Mrs. Me hooked a Piranha and, accompanied by all sorts of squeaks & squeals, she eventually brought the poor creature on board for us all to look at. 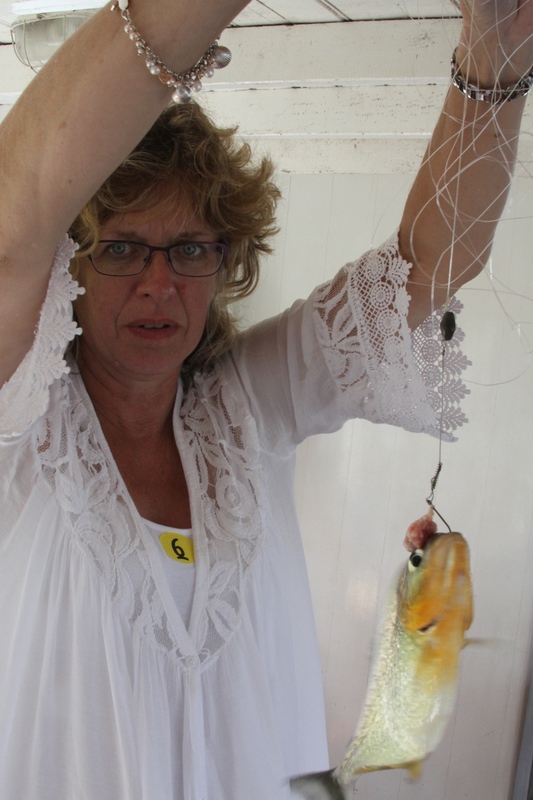 Despite me wanting get a picture of Mrs. Me kissing the Piranha, the fish was having none of it and stayed firmly with the hook and line; probably a wise choice as she would have probably have just eaten it. My next post, probably, will be about our sail-by of Devils Island and/or the crossing the line party [similar to last years Crossing the Line party but different boat, different crew & older passengers].